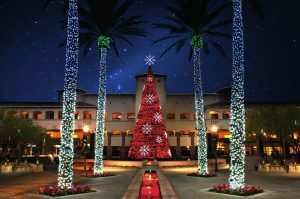 Jack Frost might not be nipping at your nose just yet, but dreams of 3 million twinkling lights and the holiday magic of Fairmont Scottsdale’s Christmas at the Princess festival is sure to get you in the spirit. As one of the best and brightest places to celebrate the holiday season, this iconic resort transforms into a winter wonderland in the desert, November 22 – December 31, 2017 and is offering an “early bird” value package to sunny Scottsdale for the holidays. This AAA Five Diamond hotel glistens with a four-story musical tree, Desert Ice skating rink, Princess Express trains, Lagoon Lights, plus holiday characters and attractions including Santa’s Secret Headquarters, a new Build-A-Bear Workshop and the new Copper Canyon Christmas Village musical light show. At the Desert Ice rink, made with real ice, skaters experience magical snowfalls, while luxury rink-side fire pit tables are the coziest place to enjoy all the merriment under a starry Scottsdale sky. S’mores Land brings more family fun with the Polar Glide ice slide, Christmas carousel, Frosty’s Ferris wheel and spots to roast s’mores sitting around the campfire. Around the lagoons, more than 3 million LEDs illuminate majestic scenes of graceful swans, a pirate ship, mermaid, whale, singing snowman family, candy cane forest and an infinity tunnel capable of 256 million color combinations. In the Enchanted Plaza, a 40-foot musical tree plays 17 songs synchronized to 70,000 dancing lights, while Saint Nick is busy in his workshop – Santa’s Secret Headquarters – mapping his flight plans, time zones and toys, where families can submit their wish lists and have a photo taken. Checking-in are the resort’s holiday friends: the lovely Princess Noel, a huggable yeti named Shivers and the squishable Graham, a walking s’more, plus Peppermint Penguin and Selfie Elfie, each bringing their own special charm from the North Pole. Memorable dining experiences range from Michael Mina’s Bourbon Steak to Toro Latin Restaurant & Rum Bar and La Hacienda by Richard Sandoval. For pampering, Well & Being Spa offers a Sugar ‘n’ Spice Aromatherapy Blending Bar, mistle-toe pedicures and peppermint manicures. The Christmas at the Princess festival is open to the public with paid admission. The Early Bird Christmas Packageincludes overnight accommodations, VIP express passes to the Princess Express Trains and Santa’s Secret Headquarters and one hour early entrance to Christmas attractions. To honor the resort’s 30th anniversary, rates start from $130 per room, per night when booked by September 30, 2017. Taxes and resort fee are additional. For complete seasonal details and pricing, visit www.scottsdaleprincess.com or call (866) 540-4495. The Fairmont Scottsdale Princess is located at 7575 East Princess Drive in Scottsdale, Ariz.